Summary: Three monks travel to a village that has suffered the ravages of famine, floods, and war on a quest to discover happiness. The villagers have grown suspicious and distrustful so they shut their doors and refuse to welcome the visitors (monks). The unwelcome monks busy themselves with preparing a small pan of soup that triggers curiosity among the villagers. The villagers begin to contribute to the making of the soup that results in a feast and grand celebration that fills them with happiness. Literary elements at work in the story: A story that centers on human nature and the ingredients for happiness categorizes this story in the genre of folk tales. Hok, Lok, and Siew are three monks who initiate, tease, and provide a distrustful village with a recipe for generosity that serves up happiness. Initially, the villagers are identified by vocation with accompanying illustrations that depict something of their nature and demeanor. The illustrations enable the reader to envision another culture but also recognize common human expressions. The words project the feelings of the villagers but the facial expressions provide a visual as to changing attitudes. The plot quickly unfolds and the quest for happiness results in a banquet with feasting, fellowship, and celebration. Perspective on gender/race/culture/economic ability: “Stone Soup” dates back centuries and circulated throughout Europe in France, Sweden, England, and other countries along with Russia. It is part of traditional folklore but lends itself to be molded into the cultural traditions that provides the listener a window into another culture. Muth sets the story in China and incorporates elements of the Buddha story tradition. The three monks Hok, Lok, and Siew are prominent in Chinese folklore and cleverly trick the villagers into making a pot of soup that enables the villagers to taste and see the richness of sharing and community. The artwork is watercolor and ink that is rich in meaning of Easten cultural symbols and illustrates the beauty of China. Theology: The “hiddenness” of God can be buried in a myriad of things, people, and events. Human tendency is often flawed in our perceptions of who God is, how God works, and God’s agenda. Letting go of things that limit us enables us to experience the limitless love and grace of God. Why do you think the villagers did not welcome the three monks? How might you describe the villagers based on studying their faces and body language on the third page of the story? What did you think of the little girl in the story who questioned the monks and wanted to know what they were doing? The monks wanted to know how to find happiness. Did the villagers help them find an answer? If so, how? Do you think life was different in the village after the monks left? 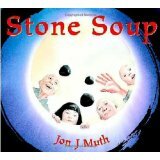 Stone Soup by Storypath is licensed under a Creative Commons Attribution-NonCommercial 4.0 International License.